Wade Malley scored Racing Club's fourth as they easily progressed to the first round of the FA Vase. Racing Club Warwick put their recent indifferent league form behind them to progress to the first round proper of the FA Vase courtesy of a 4-0 win at Stone Old Alleynians. The visitors had the first sight of goal in the 15th minute when Wade Malley fired against a post after being released by Chris Dusabe. Malley then had a good effort blocked by a defender before being denied by the keeper after being slipped in by Chris Hayden. Hayden saw a 30-yard effort drift wide before a Dusabe shot was again blocked by a covering defender. The breakthrough finally arrived in the 36th minute, with some delightful one-touch football in the middle of the park setting set up Dusabe to stroke the ball home from the edge of the area. 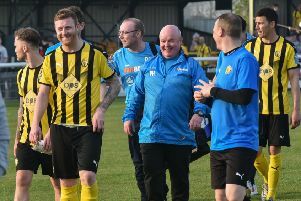 Racers continued to have the better of the game in the second period, with Tez Morton firing over in the 50th minute before Jordon Mckenzie crossed for Malley to control, turn and unselfishly slip in Morton to guide home Racers’ second from six yards. Malley fired just over before Dusabe got his second, clipping the ball over the advancing keeper after being put through by Mckenzie. Malley showed great strength to whip in a cross which just evaded Mckenzie and Racing added a fourth when Laight won possession and supplied an inch-perfect through ball for Malley who rounded the keeper to fire home. Racing Club, who travel to Littleton in the league on Saturday, have been drawn at home to Ellesmere Rangers in the first round, with the tie to be played on October 31.